How to customize on screen notifications? There was a tool to configure notifications in earlier versions of Ubuntu as described here. I tried to install it in Ubuntu 12.04 too but I failed. I want to have the notifications dynamically located (e.g. notifications for music player and volume control will be shown at the same place) and to reduce the notification duration. How do I change settings of notifications? 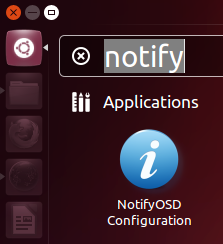 To use the congfiguration tool type "notify" into the dash and launch the NotifyOSD Configuration application. From this application you can change the colour of the notifications by clicking on the Background Colour box (in the picture below I've turned it a horrible green!). 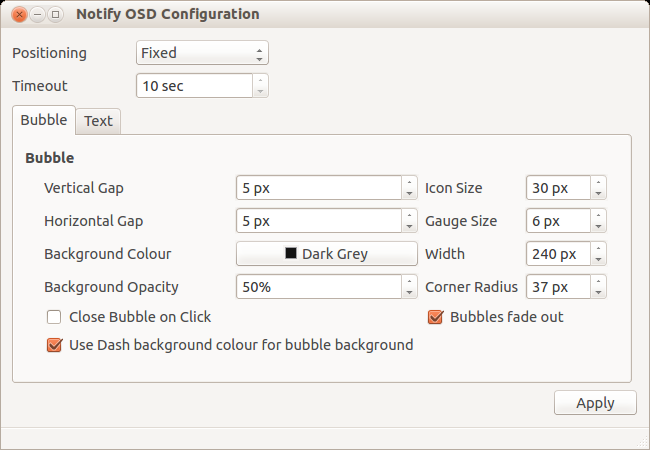 Enable/disable "use Dash background colour for the notification bubbles"
In case anyone might come to this question sometime with a Lubuntu distro (or any other of the 'Buntu flavors), please note that things might be quite different there. On Lubuntu, the best and quickest way is to use xfce4-notifyd-config; however, there is no way to have the notification dialog appear anywhere in the top center; merely the four corners are supported. But for those that don't need more, this will be sufficient by far to get the notification dialog out of the way when something else has been placed there and would constantly interfere resp. overlap. Which does not fully install it (you won't be able to find it in the dash) but it does work. In my tool there are 3 Checkbox options at the end of Bubble tab which is not shown in previous answer's image, these options worked for me, I'll suggest U recheck the procedure of installation of this tool. Not the answer you're looking for? Browse other questions tagged notification notify-osd or ask your own question. How can I change the location of the Ubuntu notifications? How do I change the background of the notification bubbles? Is there a way to view notification history? How do I disable the chameleon effect in notifications and the Unity launcher? How can I make notifications appear on a specific monitor? How can I make smaller pop-ups on Lubuntu? Can I open email by clicking on notification? How to show the new style notifications? How can I customize/disable notification bubbles? 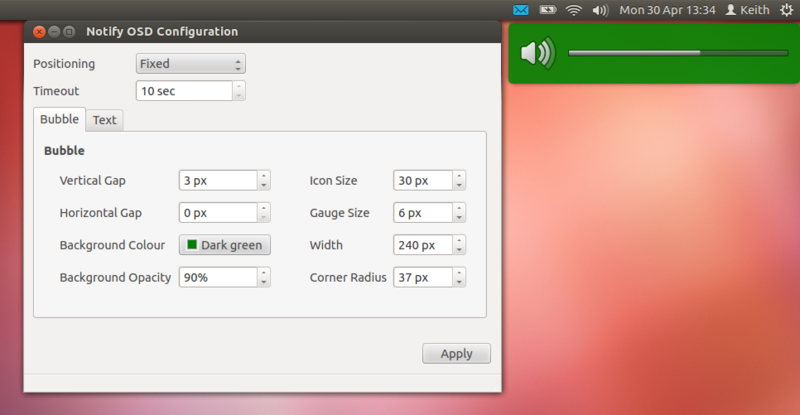 How to change Ubuntu 12.04 Unity volume notification? How can I reset the notifications?